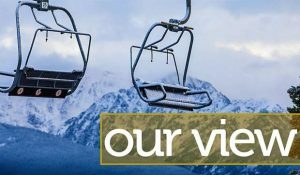 Vail Daily editorial: Who’s the boss? Humans don’t have fur or fangs — mostly. That means we have to rely on our brains for survival. That generally tends to work pretty well. But sometimes nature lets us know we aren’t really in charge. Nature has asserted itself pretty forcefully lately. If March comes in like a lion and leaves like a lamb, then January has come in like some weird cross of a snow tiger and a hippopotamus, with no kittenish behavior in sight, at least through this week. That’s fine. We live in a place that celebrates snow and the more the better — usually. Our brains have crafted some ingenious ways to survive and prosper in our winter environment. From snow plowing to slope grooming and more, we’re well adapted. But in stretches, all of our ingenuity and planning comes up short in the face of unpredictable nature. Sure, we all know it can rain for a whole day in January, but that doesn’t happen often and always makes a mess when all of that water freezes. Here, the mess mostly impacts the ways we get around, from the roads to the skies. It also creates long, long work days for highway crews, emergency responders and private plowing companies. Thankfully, the mess of the past few days has been relatively benign in our area, resulting in nothing more than inconvenience for most of us — and, in some cases, unexpected activity on our credit cards. The mess regarding tourism is one thing, but we’re fortunate to have missed the remarkable winds that hit the Colorado Springs area on Monday. If you missed that news, wind gusts measured at up to 100 mph in places, destroyed several building roofs, uprooted a number of large trees and overturned more than 15 heavy trucks in just the afternoon. Then there’s the massive rain atop the feet of snow that has hit northern California in the past few days. January flooding uproots lives as well as trees. “Mayhem” is an appropriate word. There’s nothing much to do but hunker down and ride it out when nature decides to throw a curve ball to humanity. When that happens, we need to drive more slowly, breathe more deeply and, if possible, get out and play in the white bounty that crazy ol’ nature has bestowed upon us.